THURSDAY, March 9, 2017 (HealthDay News) -- Clocks will spring ahead one hour with the time change on Sunday morning, but medical experts have plenty of advice on how to weather that lost hour of sleep. "'Gaining' an hour in the fall is much easier for our bodies than 'losing' an hour in the spring," said Dr. Praveen Rudraraju, medical director of the Center for Sleep Medicine at Northern Westchester Hospital in Mount Kisco, N.Y. Starting a few days before the time change, people can prepare themselves by going to bed 15 or 20 minutes earlier each night, according to the American Academy of Sleep Medicine. But it can still be hard to adjust to the switch afterwards, sleep specialists said. "In fact, it may take some people up to a week to get used to the new time change," Rudraraju said. "Though it may be tempting to stay up an extra hour, one of the best ways to fight the effects of daylight saving time is to go to bed at your usual time." Another sleep expert likened the time change to a slight case of jet lag. "It's like flying from Chicago to New York," said Saul Rothenberg, a behavioral sleep medicine specialist at Northwell Health in Great Neck, N.Y. "Good sleepers may not even notice a difference." But if you're sensitive to time changes or sleep disruptions, you could have trouble falling asleep at night or waking up in the morning, at least for the first few days, he said. 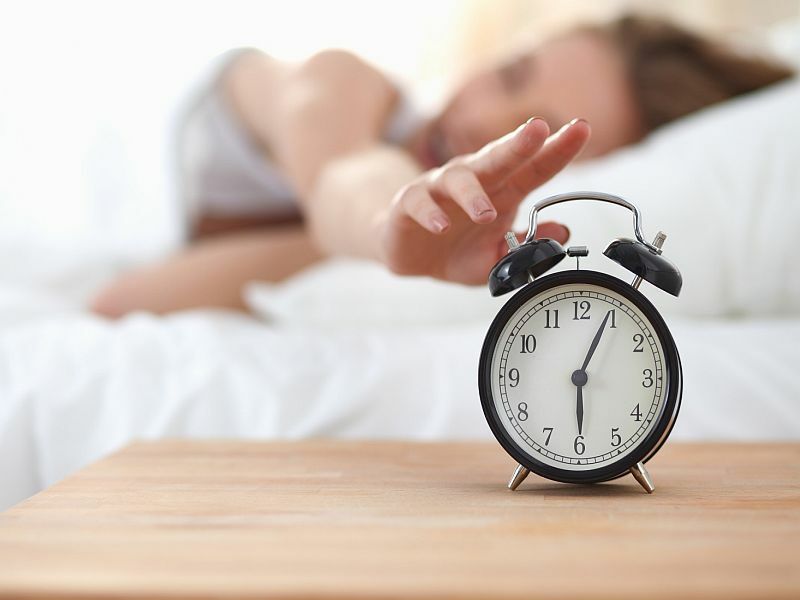 For those folks, Rothenberg offered some tips for countering the effects of the time change: Don't sleep in on Sunday morning; don't nap Sunday afternoon; and don't fret, because worrying will just make it harder for you to sleep. However, Rothenberg recommended you should get some morning light, and listen to your body if you can't fall asleep at your regular bedtime the first few nights. Rudraraju offered some advice of his own. For the first few weeks, try to wake up five or 10 minutes earlier every two to three days, he suggested. And exercise for 30 to 40 minutes in bright light each day, but do it before 5 p.m.
Don't drink caffeinated beverages, Rudraraju added, and eat dinner at least three to five hours before bedtime. At dinner, don't have more than one alcoholic drink. Stop all computer activity an hour before bedtime, and stay out of the bedroom until it's bedtime, he said. If you still have trouble falling asleep, try taking a melatonin pill two hours before you want to go to sleep, said Rudraraju, who noted the pills are available without a prescription. Another sleep expert had bedroom-specific advice for handling the time change. Robert Oexman, director of the Sleep to Live Institute in Mebane, N.C., said keeping the bedroom cool, dark and quiet will help you sleep through the time change. Beyond that, a good mattress and pillows always help, and you should consider separate blankets if you sleep with a partner. That way, you won't be disturbed during the night by your partner hogging the covers, he said. SOURCES: Praveen Rudraraju, M.D., medical director, Center for Sleep Medicine, Northern Westchester Hospital, Mount Kisco, N.Y.; Saul Rothenberg, Ph.D., behavioral sleep medicine specialist, Northwell Health, Great Neck, N.Y.; Robert Oexman, D.C., director, Sleep to Live Institute, Mebane, N.C.